If you are college or university educated, you have undoubtedly been taught that humanity originated through the theoretical process called evolution. But the educated of this world in nearly all cases have been taught only one side of the subject of origins — the theory of evolution. On the contrary most of those lacking higher education in the United States "Bible Belt," for example, have been taught only, and accepted without PROOF, the teaching that the Bible is indeed the very Word of God. Isn't it about time — and the point of rational wisdom, that you PROVE this important question once and for all? Because, IF the Bible is in fact the inspired authentic Word of a living, all knowing, all powerful God, then your eternity will be judged by it. Then in its chapter of origins, in Genesis, it explains definitely with authority how man originated, how the first man made a decision on which human civilization has been built — and it gives the only possible explanation of WHY we live today in a world of awesome materialistic progress and accomplishment, paradoxically with appalling and escalating evils. Evolution has no explanation and no solution to offer. The Bible has both. Evolution gives no explanation of why humans exist on earth — of the present paradox of mounting evils accompanying awesome progress — no hope for the future of a world falling apart, about to destroy itself with the nuclear weapons of mass destruction. No explanation of the cause of the appalling evils and the hopeless future staring so many youths in the face today. The Bible explains it all. It reveals the causes, the present effects, and the tremendous PURPOSE being worked out here below. 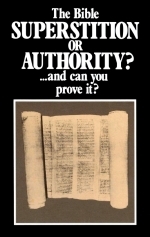 Here is a book — the Holy Bible — that dares to write out the future history of this world in advance — that dares to prophesy what is actually going to happen within 15 or 20 years to specific nations, including Russia, the British Commonwealth, China, the United States, Italy, Turkey, Ethiopia, and many others — most of the major nations of this world. Who is this claiming to foretell the future? Is it merely some ignorant, ancient human with no power to make good his boast, who wrote this blistering challenge to the skeptics, recorded in Isaiah 41:21-23? — "Now, the Eternal cries, bring your case forward, now, Jacob's King cries, state your proofs." Yes, state your PROOFS! "Let us hear what has happened in the past, that we may ponder it, or show me what is yet to be, that we may watch how it turn out; yes, let us hear what is COMING, that we may be sure that you are gods; come, do something or other that we may marvel at the sight! — why, you are things of naught, you can do nothing at all!" (Moffatt translation). History shows human civilization started with the development of a few single cities — Babylon, Nineveh and others. These city-states developed into the earliest nations — Assyria, Egypt, Israel, Phoenicia, Chaldea, etc. Then, about the 7th century B.C., the first empire over nations was formed by the ancient king Nebuchadnezzar of Babylon — the Chaldean Empire. About 604-585 B.C. the Chaldean armies invaded and took captive the Jews in the land of Judea. Among these Jewish captives, removed from their land and deported to Babylon and Chaldea, was a very brilliant Jewish lad named Daniel. There is one prophecy concerning the Jewish people, that they were to be invaded and conquered, driven out of their own land and would be punished for a period of 2,520 years. (See Leviticus 26:14-39 and, for a full explanation, read our free book "The United States And Britain In Prophecy".) Now, put that together with other prophecies such as Haggai 2:20-22. Exactly 2,520 years from the time that they were invaded and the land of Palestine was given over to King Nebuchadnezzar in 604 B.C. the very nation to whom that land was deeded by God Almighty took possession of it. A certain date according to the Hebrew calendar, will coincide with a certain date on the Roman calendar one year, but the next year will be about 11 days earlier, or maybe about 18 days later in the year, because the Hebrew calendar — sometimes called the sacred calendar, which came from God — goes according to the moon and runs in 19-year cycles. The Roman calendar by contrast was concocted by men who tried to make it come out right every year, and they've never been able to make it do that! Nebuchadnezzar was the first real world ruler. He had conquered a vast empire, including the nation Judah. This king had a dream so impressive it troubled him — moved him to tremendous concern. He demanded that his magicians, astrologers and sorcerers tell him both what he had dreamed and what it meant. They could not. They were baffled. Then Daniel was brought before the king. First, God's purpose was to reveal to this world-ruling human king that there is a GOD in heaven — that GOD IS SUPREME RULER over all nations, governments and kings — that God RULES THE UNIVERSE! It was God who placed the cherub Lucifer on the throne of the earth and Lucifer, who has become Satan the Devil, remains on earth's throne only because God allows it, and only until God sends Jesus Christ to sit on that throne when he removes Satan. This Chaldean king knew only about the many pagan demon gods. He knew nothing of the true living ALMIGHTY God. Like people and rulers, even today, he did not know that God is the living, REAL, active, RULING and GOVERNING PERSONAGE who actually and literally governs not only what is on earth, but the UNIVERSE ENTIRELY! The whole purpose of this DREAM was to reveal GOD'S GOVERNMENT — the fact that God RULES — the truth of THE KINGDOM OF GOD — the very thing that is the one and only true GOSPEL OF JESUS CHRIST! And, secondly, to reveal — preserved in writing for us TODAY — what is to happen in the latter days — actually within the next two decades — THIS LAST HALF OF THE TWENTIETH CENTURY. This is no dry, dull, dead writing for a people of 2,500 years ago. This is LIVING, TREMENDOUS, BIG NEWS for OUR DAY! It is advance news for us, NOW. News before it happens — of the most colossal event of all earth's history certain to occur in your lifetime — during the very next few years! Read, in your own Bible, Daniel 2, verses 28 through 35. In his dream, this king had seen a vast statue — larger than any image or statue ever built by man — so colossal it was terrifying, even in a dream. Its head was of fine gold, its breast and arms of silver, the belly and thighs of brass, legs of solid iron, feet a mixture of iron and clay. There was a time element. Nebuchadnezzar had viewed it until a supernatural STONE came from heaven, smashing the statue on its feet. Then the whole of the statue broke into small pieces, and was actually blown away by the wind — it disappeared! Then this STONE expanded miraculously and quickly became a great MOUNTAIN — so great it filled the whole earth! What did it mean? Did it have meaning? Yes, because this was God's doing. Unlike ordinary dreams, this one was caused by God to convey the message of God's sovereignty to Nebuchadnezzar — and, because it is part of the written Word of God, to us today — to reveal important facts of the TRUE GOSPEL! "Thou, O king, art a king of kings" — he was the first real WORLD RULER over a world empire! " ....for the God of heaven hath given thee a kingdom, power, and strength, and glory." God was revealing himself to this human world-dictator as the MOST HIGH Ruler over all. Notice! This is speaking of KINGDOMS. It is referring to kingdoms that bear rule over the people on earth. It is speaking of GOVERNMENTS! It is not speaking of ethereal sentiments "set up in the hearts of men." It is not speaking of churches. It is speaking of the kind of GOVERNMENTS that bear RULE and AUTHORITY over nations of PEOPLE here on earth. It is literal. It is specific. There is no misunderstanding, here, as to what is meant by the word kingdom. There is no misunderstanding the interpretation. GOD gives his own interpretation through the prophet Daniel. The great metallic image represented national and international GOVERNMENTS — real, literal KINGDOMS. Then, verse 40, the legs of iron represent a fourth world empire. It was to be strong, even as iron is strong — stronger militarily than its predecessors. Yet, as silver is less valuable than gold, brass than silver, iron than brass, though each metal was harder and stronger, the succession would deteriorate morally and spiritually. The two legs meant the fourth empire would be divided. "And in the days of these kings ... " — it is here speaking of the ten toes, part of iron and part of brittle clay. This, by connecting the prophecy with Daniel 7, and Revelation 13 and 17, is referring to the new UNITED STATES OF EUROPE that is now forming, out of the European Common Market, before your very eyes! Revelation 17:12 makes plain the detail that it shall be a union of TEN KINGS OR KINGDOMS that (Rev. 17:8) shall resurrect the old ROMAN EMPIRE. "... shall the God of heaven set up a kingdom, which shall never be destroyed ... but it shall break in pieces and consume all these kingdoms, and it shall stand for ever"! Now here we have described FOUR universal world empires — the only four that ever existed! Revelation 13 and 17 show that, after the fall of the original Roman Empire, there would be ten revivals — SEVEN of which would be ruled over by a gentile CHURCH — the "daughter" of ancient BABYLON — a church claiming to be Christian, but actually named by God "MYSTERY, BABYLON the great" — or, more plainly, BABYLONIAN MYSTERIES! Six of those have come and gone. The seventh is now forming — the last, final brief resurrection of the Roman Empire by ten European groups or nations. These are revealed in Daniel 2 as the ten toes of iron and clay mixed. In their days — and they shall last but a very short space, possibly no more than two to three-and-a-half years — shall the GOD OF HEAVEN SET UP A KINGDOM that shall never be destroyed. 4. Cassander, ruling Greece and Macedonia. Thus was the prophecy of verse 4 fulfilled to the letter. In fulfillment of the latter part of verse 10, Antiochus the Great, after 27 years, recovered his fortress, Seleucia, and he also conquered the territory of Syria, as far as Gaza, including Judea. But the young Egyptian king, now Ptolemy IV (Philopator), was roused, and with an army of 20,000 inflicted severe defeat on Antiochus the Great; and fulfilling verse 12, he killed tens of thousands and again annexed Judea to Egypt. But he was not strengthened, for he made a rash and speedy peace with Antiochus, and returned to dissipation, throwing away the fruits of victory. Says verse 12, "And when he hath taken away the multitude, his heart shall be lifted up; and he shall cast down many ten thousands: but he shall not be strengthened by it ["prevail" — RAV, RSV]." Verses 15-16 — "the glorious land," of course, refers to Judea, the Holy land. Antiochus the Great besieged and took Sidon from Egypt, ruined the interests of Egypt in Judea at the Battle of Mount Panium, 198 B.C., and then Antiochus took possession of Judea. Verse 17 — "upright ones" (see margin) in Hebrew means "equal conditions, or marriage," but the one he marries will not stand on his side. In 198 B.C., Antiochus arranged a marriage between his daughter, Cleopatra (not the Cleopatra of 31 B.C. in Egypt) and young Ptolemy Epiphanes, king of the south, by which he hoped subtly to gain complete possession of Egypt; but the plan failed. Verse 18 — and so Antiochus turned his attention in another direction and tried to conquer, 197 to 196 B.C., the islands and coasts of Asia Minor. But the Roman general, Lucius Cornelius Scipio Asiaticus, utterly defeated him at the Battle of Magnesia, 190 B.C. Verse 19 — Antiochus next turned his attention to the fortresses of his own land, in the east and west. But, attempting to recruit his dissipated wealth by the plunder of the Oriental Temple of Belus, in Elymais, he was killed, 187 B.C. Verse 20 — Seleucus IV Philopator (187-176), his son, in an effort to raise money, sent a tax collector, Heliodorus, through Judea. But he reigned only 11 years, when Heliodorus poisoned him. Verse 21 — he left no heir. But his brother, a younger son of Antiochus the Great, named Epiphanes (Antiochus IV), a contemptible reprobate, came by surprise and through flattery took the kingdom. To his aid came his assistant, Eumenes. Rawlinson says, page 255, "Antiochus [Epiphanies], assisted by Eumenes, drives out Heliodorus, and obtains the throne, B.C. 176. He astonishes his subjects by an affectation of Roman manners" and "good-natured profuseness [flattery]." Verse 22 — "the prince of the covenant" does not refer to Christ. This was the attempt of Antiochus to replace the Jewish high priest by another who would be subservient to him. Verses 23-24 — although only a few were with him at first, yet by this "Roman manner," by deceit and flattery, he crept into power and prospered. He also invaded Galilee and Lower Egypt. His fathers, the former kings of Syria, had favored the Jews, but says Rawlinson, page 255, they "were driven to desperation by the mad project of this self-willed monarch." Verse 25 — Rawlinson, pages 255-256, says, "Threatened with war by the ministers of Ptolemy Philometor [now king of the south], who claim Coele-Syria and Palestine as the dowry of Cleopatra, the late queen-mother, Antiochus marches against Egypt ... B.C. 171" (pp. 227-278). But he was met by his nephew, Ptolemy Philometor, king of the south, with another immense army. But the Egyptian king was defeated through the treachery of his own officers and was outwitted by Antiochus. Verses 26-27 — continuing in Rawlinson, page 278: "After his victory at Pelusium, Antiochus advanced to Memphis, and having obtained possession of the young king's person [Ptolemy Philometor, king of the south], endeavored to use him as a tool for effecting the entire reduction of the country." In 174 B.C., the uncle of the king of the south sat at a banquet. Antiochus pretended to ally himself with the young Ptolemy, against his brother, Euergetes II, but each was trying to deceive the other. Verse 28 — in 168 B.C., returning from Egypt with great plunder, Antiochus set himself against the Jews, massacred many, and then returned to Antioch with golden vessels from the Temple at Jerusalem. Verse 29 — the same year, he again invaded Egypt, but with none of his former success, because Philometor, king of the south, got help from Rome. Verse 30 — the Roman fleet came against Antiochus, he was forced to surrender to the terms of Popillius, commander of the Roman fleet, and retire from Egypt and restore Cyprus to Egypt. Returning through Judea, smarting under the defeat, he vented his exasperation against the Jews, and extended special favors to those Jews who would turn from their religion. Verse 31 — then, 167 B.C., the next year, came the climax of the horror. Antiochus sent troops to the Holy Land, who desecrated the Temple and sanctuary, abolished the daily sacrifice (see also Daniel 8:11, 24) and (Kislev 15, Hebrew calendar) placed the abomination — an imagine the altar in the temple precincts, making it desolate (Rawlinson, p. 255). Many who claim to teach the Bible try to apply the prophecy of this verse to Moslems in the 7th century A.D., building the Dome of the Rock on the supposed site of the ancient Temple at Jerusalem! But every verse of this prophecy, step by step, verse by verse, unfolded in actual history, just as here recounted, so there can be not the slightest shadow of doubt as to this abomination that "maketh desolate" — it was an idol set up in 167 B.C., by Antiochus Epiphanies. Verse 32 — Antiochus tried to end the religion of the Jews. He took away the daily sacrifice, forbade the ministration at the Temple. He perverted by flatteries the Jews who were willing to forsake their religion. But — right here, the prophecy cuts off from the continuation of events in the history of those ancient north and south kingdoms. Up to this point, the prophecy was unfolded, step by step, in the actual history of the northern kingdom of the Seleucidae, or Syria, and the southern kingdom of Egypt. But, say most commentaries, all accurate details seem suddenly to stop short with this verse. Verse 33 — "And they that understand among the people shall instruct many: yet they shall fall by the sword, and by flame, by captivity, and by spoil, many days." Verse 34 — "Now when they shall fall, they shall be holpen with a little help: but many shall cleave to them with flatteries. And [verse 35] some of them of understanding shall fall, to try them, and to purge, and to make them white, even to the time of the end: because it is yet for a time appointed." Verse 36 — The king of the north — who is he, now, in the early and middle New Testament times, to which our prophecy has come? In 65 B.C., Syria was swallowed up by the Roman Empire, and became a Roman province. The Roman emperor now controlled Judea, and therefore the king of the north, here referred to, is, at this time, the emperor of the Roman Empire. This verse says he should do according to his will, and he did — exalt himself, and magnify himself above every god, and he did; for the Roman emperors required all to worship them and sacrifice to them, as a god. He was as a god. He was to speak against the true God, and he did and persecuted all Christians. Verse 37 — his fathers had worshiped idols, but the Roman emperors set themselves up as gods. Verse 39 — the emperors did acknowledge the supremacy of religion, increased it with material glory and caused it to rule over many. Verse 40 — "And at the time of the end shall the king of the south push at him ...." Who is today the "king of the south"? At the time of the end — our time — this king of the south was to push at the king of the north, now at Rome! In 1895 King Menelik, of Ethiopia, sent an army of 9,000 to 10,000 men against General Baratieri's Italian army. A whirlwind comes in the air, sweeping all before it. Mussolini did send a great air force into Africa! Also many modern "chariots" — trucks, tanks, etc. — and ships, loaded with soldiers. More than 100,000 sailed to Ethiopia. And, notice it, Mussolini's forces were to pass over — in the air! It is at this precise point in this astounding prophecy that Mussolini's struggle in Ethiopia and in World War II ended. Mussolini did not finish the prophecy. There is yet another leader to arise in Europe! Notice what will next happen! Verse 41 — "He shall enter also into the glorious land ..." — the Holy Land. This is soon to be fulfilled. "And," continues verse 41, "many countries shall be overthrown: but these shall escape out of his hand, even Edom, and Moab, and the chief of the children of Ammon" — the modern land of the Hashemite Kingdom of Jordan. The coming dictator will unite many others with him — 10 in all (Rev. 17:12) — reviving the ancient Roman Empire. Verse 43 says the Libyans and Ethiopians (observe that after its conquest by Mussolini, Ethiopia is not again referred to as the king of the south) shall be at his steps — and he will then control them. Italy lost control of Libya and Ethiopia at the end of the war. Verse 44 — but news out of the east and out of the north — Russia and the Orient — shall trouble the revived Roman Empire. Russia will enter the war! Verse 45 — the coming Roman Empire shall establish its palace, as capital of the revived Roman empire, and eventually its religious headquarters, at Jerusalem! Zechariah 14:2 says the city shall be taken! "Yet he shall come to his end, and none shall help him"! This language signifies the end of the "beast" and the "false prophet" at the hand of God! You will find this end described in Revelation 19:19-20 and Zechariah 14:12. Read our free booklet "Who or What Is the PROPHETIC BEAST?" And now what is the time of this end, at the close of this marvelous prophecy? The next verse, Daniel 12:1, says at the time of the resurrection of the just — at the Second Coming of Jesus Christ! This prophecy begins with the kingdoms of Syria and Egypt, soon after the death of Alexander the Great — 2,300 years ago. But it ends at the time of the resurrection and the Second Coming of Christ to bring peace at last to the region — and to the entire world! It is so plain, there can be no doubt of its right application! Jesus was speaking to his disciples atop the Mount of Olives, facing Jerusalem from the east. The gospel of Christ, the only gospel he proclaimed and taught, was the kingdom of God. In verse 11 of this same speech Jesus warned them that many false prophets would arise. In verse 4 Jesus warned these apostles: "Take heed that no man deceive you." He was speaking to them. He had preached to and taught them the good news of the kingdom of God. In verse 5, Jesus said to his disciples, "For many shall come in my name," — every place in the Bible when people came in the name of Christ they were appearing as his representatives or ministers, "saying I [Jesus] am Christ, and shall deceive many." That happened. Within a very short period after the Church was founded on the day of Pentecost, A.D. 31, a violent controversy arose concerning whether the gospel to be proclaimed was the gospel OF Christ — Jesus' own gospel that he proclaimed and taught, or a gospel ABOUT Christ. Jesus had come as a messenger bearing a message from God about the kingdom of God. That message was his gospel. But soon many were ignoring Jesus' gospel — the kingdom of God — and preaching merely that Jesus was the Christ, preaching about the messenger, ignoring his message or gospel. That is still continuing today. In Galatians 1:5-6 we learn they were, only 20 years after the Church was founded, turning to another gospel than that which Jesus taught.